HAVANA TIMES — Twenty four days since his last operation to extract cancerous cells, Venezuelan President Hugo Chavez “has the same fighting spirit, of strength, with his usual energy and confidence,” said VP Nicolas Maduro upon returning from Cuba to the South American country on Thursday. Out of the public eye since the December 11th operation in Havana, with no recorded messages broadcast, Chavez has suffered a setback in his recovery process “having confronted complications as a result of a serious lung infection,” informed the Venezuelan government on Friday. “The infection has caused a situation of breathing insufficiency that has required Chavez maintain a strict medical treatment,” added the press release that did not state whether Chavez was using any life support equipment. No mention has been made by the Venezuelan authorities as to the success of the operation in Chavez’ battle against cancer or the course of action to follow when the respiratory crisis is resolved. “The government of Venezuela reiterates its confidence in Chavez’ medical team, which maintains an ongoing monitoring of the evolution of the patient and has acted with the utmost thoroughness with each difficulty presented,” said the press statement. 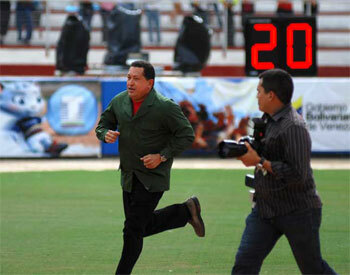 He noted that Chavez’s vital signs are stable despite the respiratory problems “that have affected him seriously”.